During the past decade, insights into the history and extent of the former British Ice Sheet (BIS) off northwest Britain have been revealed by the integration of geomorphological information from geophysical data with stratigraphical and lithological data from sea-bed cores. In particular, the emergence of three-dimensional seismic acquisition as a tool for regional reconnaissance has resulted in near complete coverage of the outer continental shelf and slope in areas of active oil exploration. The first signal returns from three-dimensional exploration surveys can be utilized to create a regional image of the sea-bed morphology. Such an image has been developed for the outer continental shelf and slope west of Shetland (Bulat & Long, 2001) (Fig. 31.1). When combined with more traditional two-dimensional seismic reflection profile data, this three-dimensional imagery reveals the footprint left by an expansive BIS. Figure 31.1 Location of the West Shetland margin; bathy-metric contours in metres. 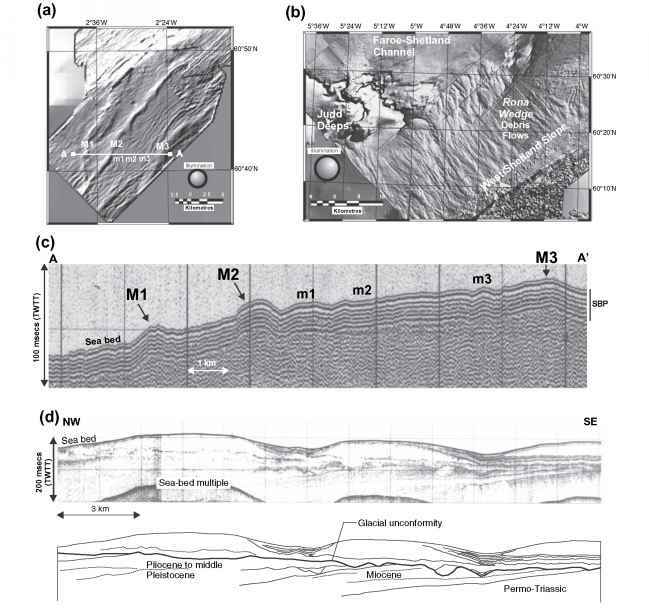 Figure 31.2 (a) Sea-bed relief image of the outer shelf illuminated from the northwest illustrating the northern area of morainal ridges of various scales; (b) sea-bed relief image illuminated from the northeast over the southern end of the West Shetland Slope and Faroe-Shetland Channel, illustrating the debris flows of the Rona Wedge, and the smooth to irregular (Judd Deeps) floor of the Channel; (c) BGS high-resolution seismic (1 kJ sparker) profile (79/14-23) across the large (M1-M3) and small (m1-m3) morainal ridges illustrated in (a); (d) BGS high-resolution seismic (1 kJ sparker) profile (83/04-31) and interpreted line drawing of the morainal ridges in the southern area, highlighting their younging to the southeast, and their relation to the acoustically well-layered, ponded, sediments. Images and profiles in (a), (b) and (d) located in Fig. 31.1. Abbreviations: TWTT, two-way travel time; msecs, milliseconds; SBP, sea-bed pulse. expansion of the BIS. West of Shetland, the present-day sea-bed morphology is considered to largely reflect the last (late Deven-sian, MIS 2) expansion of the BIS (Stoker, 1995; Hall et al, 2003). Geophysical data have revealed two main geomorphological features that indicate a shelf-edge terminal position for the BIS during peak, late Devensian, glaciation, west of Shetland: (i) a series of end moraines preserved on the outer shelf, beyond which lie (ii) the glacially fed sedimentary fans of the Rona and Foula wedges, on the West Shetland Slope (Fig. 31.1). The end moraines behind the Foula Wedge are clearly evident on the sea-bed image, which shows three arcuate moraines (M1-M3) that can be traced for up to 30km (Fig. 31.2a). At the southwest edge of the image, M1 and M2 appear to coalesce. A high-resolution seismic reflection profile crosses the moraines indicates that they are up to 1.5 km wide and 20m high (Fig. 31.2c). The crests of the moraines currently lie between 110 and 145 m water depth. The area between M2 and M3 preserves similar, albeit smaller, features (m1-m3) that have a relief of about 5 m or less. Unfortunately, the internal structure of all the moraines is obscured by the seismic artefact of a thick sea-bed pulse. A second area of end moraines occurs behind the Rona Wedge (Fig. 31.1). Although these are less well defined on the sea-bed image, in profile they are individually much larger than those to the north, being up to 50 m high, 8 km wide and traced laterally for up to 60km (Stoker & Holmes, 1991) (Fig. 31.2d). The crests of these moraines are currently at a water depth of 140-150 m. Internally, the moraines are largely acoustically structureless, although hyperbolic reflections are present, most probably originating from cobbles and boulders on the ridge crests and from sporadic bedding surfaces. The northwest flank of each moraine interdigitates with acoustically well-layered, ponded, strata. This indicates both a coeval relationship between the moraines and ponded sediment, and the systematic younging of the glacial succession towards the land (to the southeast). Linkage between the two areas of moraines is unclear owing to incomplete coverage of the sea-bed image on the outer shelf. We interpret the end moraines in both areas to be recessional icesheet moraines. In the northern area, the smaller moraines (m1-m3) may represent short-term halts in the retreat of the BIS, whereas the larger moraines mark a relatively long halt, with time enough for the localized deposition of the ponded sediments in the southern area. The observation that the most landward moraine imaged in Fig. 31.2d overlies layered strata, which postdates the middle moraine, may reflect a considerable readvance of the BIS during the general phase of overall recession. On the West Shetland Slope, stacked, glacigenic, debris-flow deposits comprise the glacially fed Rona and Foula sediment wedges, which are up to several hundred metres in thickness (Stoker, 1995; Davison & Stoker, 2002). The sea-bed image highlights the Rona Wedge, and reveals the characteristically elongate and lobate form of the debris flows, together with indications of linear channelling in the mid-slope region (Fig. 31.2b). Seismic profile data show that individual lobes commonly range from 5 to 20 m in thickness, and the sea-bed image indicates that their downslope extent can be measured in kilometres. On the Rona Wedge, the debris-flow deposits extend the length of the slope, and are gradually transgressing across the floor of the Faroe-Shetland Channel, infilling the major deep-water erosional scours of the Judd Deeps (Fig. 31.2b). In contrast, the Foula Wedge is less extensively developed, being essentially restricted to the upper slope (Fig. 31.1). This lateral variation in slope-apron architecture is well illustrated on the sea-bed image by the relatively sharp northeastern edge, at about 60°30'N, of the Rona Wedge. This implies that the glacially fed fans represent zones of discrete, focused, deposition on the West Shetland Slope. The association of the fans and the moraines is consistent with a late Devensian ice terminus for the BIS, which locally reached the edge of the West Shetland Shelf. 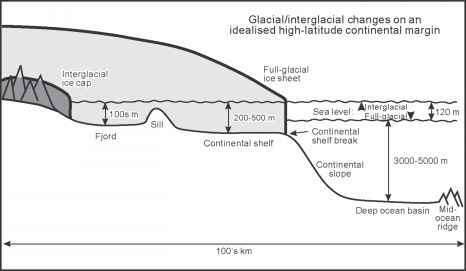 The glacially fed fans developed during peak glaciation, whereas the moraines represent stages in its recession. It is becoming increasingly apparent that glacially fed fans (also referred to as 'trough mouth fans') are important indicators of former ice streams (Stokes & Clark, 2001). It may be no coincidence that a number of cross-shelf bathymetric troughs converge on the outer West Shetland Shelf adjacent to the fans (Fig. 31.1). Preliminary indications suggest that a zone 40-60 km wide on the outer shelf may have fed the Rona Wedge. An ice stream of this width is within the dimensions of those identified elsewhere by Stokes & Clark (2001).